They have doomed their whole political party, nobody wants revenge drived electives. There certainly was collusion, between hillary, obumber and the entire American intelligence agencies. There was collusion. No doubt. When a network gives one of the candidates the debate questions in advance, that’s collusion. When another has foreign agents in his campaign (with access to classified documents), that’s collusion and against the law. 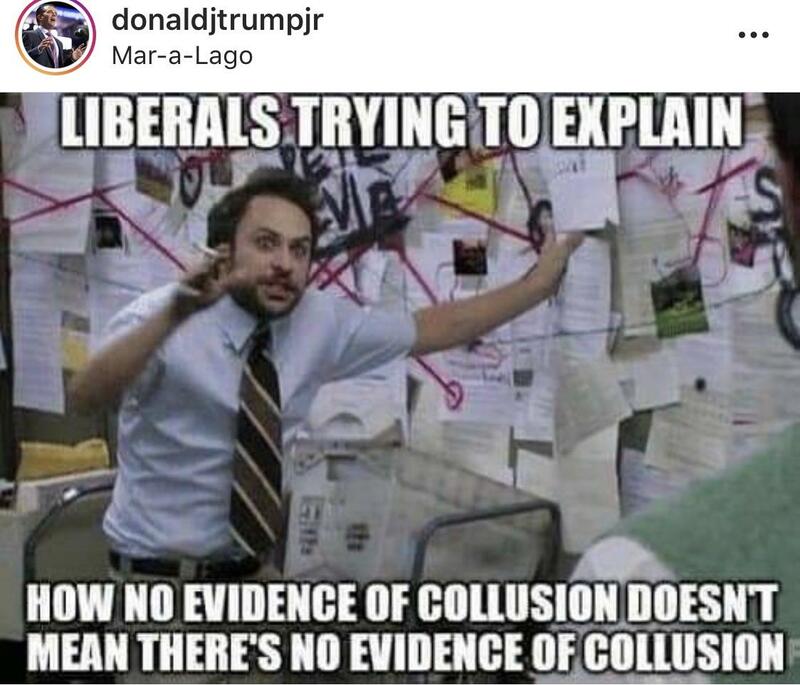 So yes, there was collusion but it the Democrats in violation. This is because the entire episode is political. Facts have never mattered. It is demented for normal people, but it is practical: they have to keep their base charged up for the 2020 election. And we all know that Obama’s “birth certificate” is a forgery. Definition: Collusion is an informal term, not a technical or legal concept. You wont find collusion defined in the federal criminal code. No one is going to be indicted for “collusion.” And Jerry “TheFat Kapo” Nadless, as a lawya, knows this. So he’s just an effing liar. Don’t interrupt the enemy when they’re making mistakes. It’s all because democrats can say whatever and there is no accountability. I can’t be critical. I still believe in Santa and the Tooth Fairy and the Easter Bunny. True. Their only play is to take advantage of gullible voters. The Mueller reports should change some polls for now, but the sockpuppet media has a strange effect on some of them, and opinion tends to swing. Because collusion is not a crime. But let’s not let facts get in the way. Hey fat boy, explain to America what collusion is and what laws cover it in our penal codes. Republicans need to use this. “Democrats are obsessed with claims that are not true”. Like socialism. Déjà vu of the presumed guilt of Brett Kavanaugh.